Dr. Khan, is a board certified periodontist & a specialist in implant procedures. 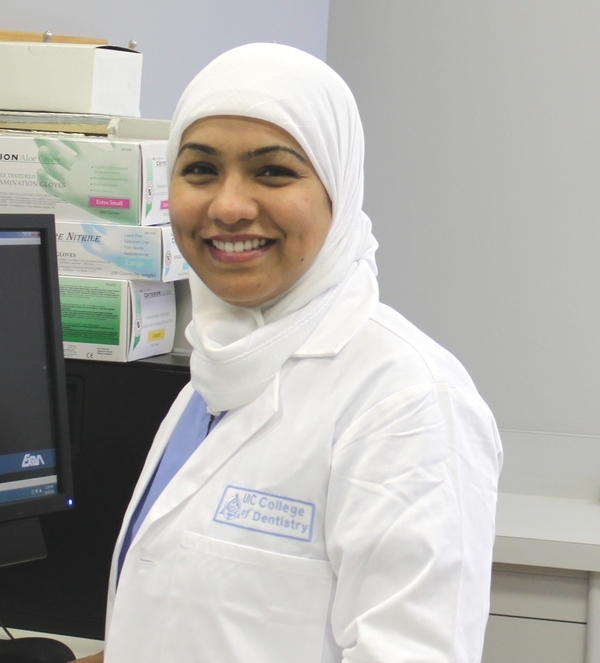 Dr. Khan earned her D.D.S at the University of Detroit Mercy - School of Dentistry; Michigan. Dr. Khan completed a three-year post-graduate residency program in Periodontology at the Indiana University-School of Dentistry, Indiana. During her training, Dr. Khan received many academic honors. In addition to her specialty training, Dr. Khan also obtained a Master of Science (M.S.D) degree in Periodontology from the Indiana University -School of Dentistry where she conducted clinical and epidemiological research. Her research was published in the prestigious journal of the American Academy of Periodontology, Journal of Periodontology. Dr. Khan has more than one publication in peer-reviewed journals. Dr. Khan serves as an Assistant Professor in the Department of Periodontics at the University of Illinois, College of Dentistry, and is actively involved in numerous professional organizations, including the American Academy of Periodontology, Academy of Osseointegration, American Dental Association, American Dental Education Association, Illinois Dental Association, Midwest Society of Periodontology, and the Chicago Dental Society. Dr. Khan performs all kinds of non-surgical and surgical periodontal procedures that include treating advanced periodontitis, surgeries to treat periodontal defects, esthetic enhancement, cosmetic procedures, sinus lifts and implants. Dr. Khan understands your periodontal problems and treats your problem very efficiently while educating you with the prevention techniques and solutions. Dr. Khan recognizes that patient needs and concerns may not be limited exclusively to disease eradication, but may also include self-image enhancement, a beautiful smile, a healthy mouth and the ability to chew and eat comfortably. In her spare time Dr. Khan enjoys exercising, biking and spending time with friends, and her loving husband - Mazhar and two adorable sons -Mubashir & Ibrahim.